A large texture pack taken from Red Eclipse's game files, repackaged for use in Sauerbraten. 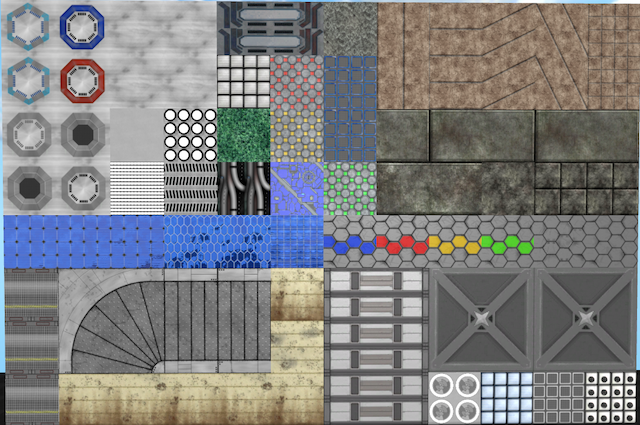 Includes a large array of clean sci-fi textures, with red, blue, yellow, and green variants of most. A lot of these textures will need envmaps for best effect. I checked the licensing and confirmed I can reshare/modify these files. I included the same RE readme with the original creator's contact info as well. I did not modify the folder name, so the install path is "packages/unnamed". I'm not a huge fan of the creator's username, but I'll respect it enough to not modify the folder. Nice to see some new textures around, even they are imported from Red Eclipse. The textures have a certain theme which is tech-like, yet not being the overtone. I do want to mention, please just package the textures within the textures directory, as they are textures, right? Also, remove githup-based clutter in your zip-file. The configuration of the textures is sometimes quite odd and seems just taken right out of Red Eclipse without actually checking if this works for Sauerbraten. the shaderparam parallaxscale has nothing to be rendered to other than perhaps the bumpmapped-texture itself. Because of this, it seems to offset the texture when looking into perspective other than bringing depth into the final form (which is the whole point of the parallax-shader). So to get the full potency of the parallax-shader, make some height-mapped texture. If you need help with it, I could provide so. The diffuse textures in Sauerbraten are defined by "0" or "d". Any other letter will work also (except those defined for other shaders), but it looks pretty dirty now. All those 0's within the config don't feel comfortable either. You could go wild with the pulseglowworld shader on the jumppad, other than some static glowworld shader. Some small map which shows off all textures would be cool. It doesn't have to be fancy at all, just some room with at max simple geometry. I heard nothing about the skyboxes which are included, or is that a secret treat? I think you did quite a good job, yet still could have some improvements.